The Cooney Furlong Grain Company supply a wide range of farm inputs including all types of seed grain, fertiliser and crop chemicals as well as animal feedstuffs and all types of agricultural plastics. Their core business is the assembly and marketing of grain. Target Fertilisers Ltd import, blend and bag fertiliser for the Irish agri market. Target fertiliser is available bulk or bagged from a large number of agricultural merchants and co-ops throughout the country. Special blends are also available. Gardiner Grain Ltd is an animal feed producer supplying competitively priced quality rations under the Avoca Milling brand. 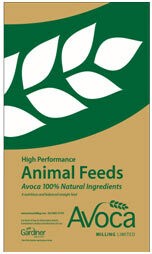 All product is manufactured in Avoca, Co. Wicklow using locally produced raw materials where possible. Kevin Cooney Ltd is also a member of the Acorn Group which is a group of leading private, grain, feed and general agri-merchants, from all over Ireland. Each member of the Acorn group is an independent company, committed to agriculture. Its primary function is collective buying to allow members and their customers to benefit from economies of scale.